1 What type of thing is underwater diving? What type of thing is underwater diving? A human activity – intentional, purposive, conscious and subjectively meaningful sequence of actions. Underwater diving is practiced as part of an occupation, or for recreation, where the practitioner submerges below the surface of the water or other liquid for a period which may range between seconds to the order of a day at a time, either exposed to the ambient pressure or isolated by a pressure resistant suit, to interact with the underwater environment for pleasure, competitive sport, or as a means to reach a work site for profit or in the pursuit of knowledge, and may use no equipment at all, or a wide range of equipment which may include breathing apparatus, environmental protective clothing, aids to vision, communication, propulsion, maneuverability, buoyancy and safety equipment, and tools for the task at hand. 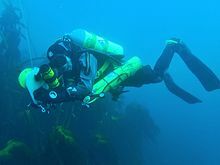 Atmospheric pressure diving – Diving where the diver is isolated from the ambient pressure by an articulated pressure resistant diving suit. Apnea finswimming – Underwater swimming in a swimming pool using mask, monofin and holding one's breath. Underwater orienteering – Underwater compass navigation and speed competition on scuba. Underwater target shooting – Breathhold underwater sport of target shooting with a speargun in a swimming pool. 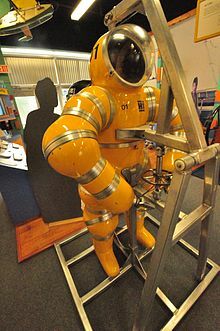 Davis Submerged Escape Apparatus – Early submarine escape oxygen rebreather also used for shallow water diving. Lambertsen Amphibious Respiratory Unit – Early closed circuit oxygen diving rebreather. Emergency gas supply – Alternative independent breathing gas supply carried by a diver. Hyperbaric stretcher – Portable pressure vessel to transport a person under pressure. Amontons' law – Relationship between pressure and temperature of a gas at constant volume. Undertow (water waves) – Return flow below (nearshore) water waves. 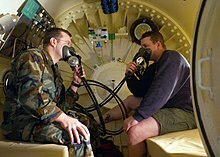 Oxygen therapy in a multiplace hyperbaric chamber is often delivered via built in breathing systems. Diving medical practitioner – A medical practitioner registered to assess medical fitness to dive, manage diving accidents, plan safety for professional diving operations, provide advanced life support, acute trauma care and general wound care. Staged image showing how victims may black out quietly underwater, often going unnoticed. Dysbarism – Medical conditions resulting from changes of ambient pressure. Folding lockout hasp, allowing six padlocks to lock out one device. Scuba diving fatalities – Deaths occurring while scuba diving or as a consequence of scuba diving. The decompression chamber at the moment the Byford Dolphin accident occurred. D1–D4 are divers; T1 and T2 are dive tenders. Berry L. Cannon – American aquanaut who died in a diving incident. Wesley C. Skiles – American cave diver and underwater cinematographer. Dewey Smith – American aquanaut. Died in diving accident. Diving regulations – The stipulations of the delegated legislation regarding the practice of underwater diving – Legislation regulating diving activity, usually a branch of occupational health and safety. Recreational dive sites are specific places that recreational scuba divers go to enjoy the underwater environment. They include recreational diver training sites and technical diving sites beyond the range generally accepted for recreational diving. In this context all diving done for recreational purposes is included. Professional diving tends to be done where the job is, and with the exception of the recreational diving service industry, does not generally occur at specific sites chosen for their easy access, pleasant conditions or interesting features. Recreational dive sites may be found in a wide range of bodies of water, and may be popular for various reasons, including accessibility, biodiversity, spectacular topography, historical interest and artifacts (such as shipwrecks), and water clarity. Tropical waters of high biodiversity and colourful sea life are popular recreational diving vacation destinations. South-east Asia, the Caribbean islands, the Red Sea and the Great Barrier Reef of Australia are regions where the clear, warm, waters and colourful and diverse sea life have made recreational diving an economically important tourist industry. Recreational divers may accept a relatively high level of risk to dive at a site perceived to be of special interest. Wreck diving and cave diving have their adherents, and enthusiasts will endure considerable hardship, risk and expense to visit caves and wrecks where few have been before. Some sites are popular almost exclusively for their convenience for training and practice of skills, such as flooded quarries. They are generally found where more interesting and pleasant diving is not locally available, or may only be accessible when weather or water conditions permit. History of decompression research and development – A chronological list of notable events in the history of underwater diving. Italian Maiale manned torpedo "Siluro San Bartolomeo" displayed at the Royal Navy Submarine Museum, Gosport, UK. USS Squalus represented by USS Sailfish (SS-192)#Sinking of Squalus and recommissioning – The successful rescue of the crew and later raising of the sunken vessel. YMCA SCUBA Program – Defunct recreational diver training and certification agency. British Underwater Sports Association (BUSA) – British affiliate to the world underwater federation sports committee. South African Underwater Sports Federation (SAUSF) – The official World Underwater Federation representative body in the Republic of South Africa. Underwater Society of America (USOA) – American national representative organization for underwater sport. Undersea and Hyperbaric Medical Society (UHMS) – US based organisation for research and education in hyperbaric physiology and medicine. Diving manual A document providing extensive general information on the equipment, procedures and theoretical basis of underwater diving. 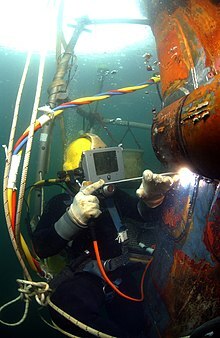 IMCA Code of Practice for Offshore Diving A voluntary code of industry best practice followed by members of the International Marine Contractors Association. MIL-S-82258:1965 Military specification. Swim fins, rubber. GOST 22469:1977 Ласты резиновые для плавания. Общие технические условия. Swimming rubber flippers. General specifications. DIN 7876:1980 Tauchzubehör. Schwimmflossen. Maße, Anforderungen und Prüfung. Diving accessories for skin divers. Flippers. Dimensions, requirements and testing. MS 974:1985 Specification for rubber swimming fins. MS 974:2002 Specification for rubber swimming fins. First revision. ÖNORM S 4224:1988 Tauch-Zubehör; Schwimmflossen; Abmessungen, sicherheitstechnische Anforderungen, Prüfung, Normkennzeichnung. Diving accessories; fins; dimensions, safety requirements, testing, marking of conformity. EN 16804:2015 Diving equipment. Diving open heel fins. Requirements and test methods. BS 4532:1969 Specification for snorkels and face masks. Amended 1977. GOST 20568:1975 Маски резиновые для плавания под водой. Общие технические условие. Rubber masks for submarine swimming. General specifications. DIN 7877:1980 Tauch-Zubehör. Tauchbrillen. Sicherheitstechnische Anforderungen und Prüfung. Diving accessories for skin divers. Diver’s masks. Requirements and testing. ANSI Z87.11:1985 Underwater Safety. Recreational Skin and Scuba Diving. 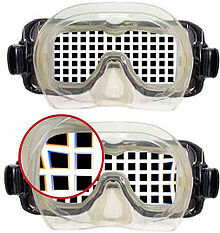 Lenses for Masks. ÖNORM S 4225 Tauch-Zubehör; Tauchmasken (Tauchbrillen); Sicherheitstechnische Anforderungen, Prüfung, Normkennzeichnung. Diving accessories; divers’ masks; safety requirements, testing, marking of conformity. CNS 12497:1989 潛水鏡. Diving mask. CNS 12498:1989 潛水鏡檢驗法. 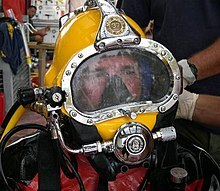 Method of test for diving mask. EN 16805:2015 Diving equipment. Diving mask. Requirements and test methods. DIN 7878:1980 Tauch-Zubehör; Schnorchel; Maße, Anforderungen, Prüfung. Diving accessories for skin divers. Snorkel. Technical requirements of safety, testing. DIN 7878:1991 Tauch-Zubehör; Schnorchel; Sicherheitstechnische Anforderungen und Prüfung. Diving accessories for skin divers. Snorkel. Safety requirements and testing. ÖNORM S 4223:1988 Tauch-Zubehör; Schnorchel; Abmessungen, sicherheitstechnische Anforderungen, Prüfung, Normkennzeichnung. Diving accessories; snorkels; dimensions, safety requirements, testing, marking of conformity. EN 1972:1997 Diving accessories. Snorkels. Safety requirements. EN 1972:2015 Diving equipment. Snorkels. Requirements and test methods. EN 1809:1998 Diving accessories. Buoyancy compensators. Functional and safety requirements, test methods. EN 1809:2014+A1:2016 Diving equipment. Buoyancy compensators. Functional and safety requirements, test methods. CNS 11251:1985 濕式潛水衣. Diving Wet Suit. EN 14225-1:2005 Diving suits. Wet suits. Requirements and test methods. EN 14225-1:2017 Diving suits. Wet suits. Requirements and test methods. EN 14225-2:2002 Diving suits. Dry suits. Requirements and test methods. EN 14225-2:2017 Diving suits. Dry suits. Requirements and test methods. EN 13319:2000 Diving accessories. Depth gauges and combined depth and time measuring devices. Functional and safety requirements, test methods. 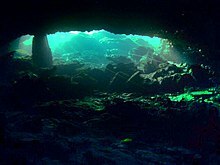 Notable dive site guides with Wikipedia article. Authors of general non-fiction works on diving topics who are the subjects of Wikipedia articles. Bob Halstead – Underwater photographer, author, journalist and commentator on the recreational diving industry. 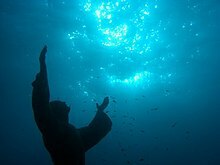 Documentary movies focused on underwater diving. Movies, novels, TV series and shows, comics, graphic art, sculpture, games, myths, legends, and misconceptions. Fiction in general relating to all forms of diving, including hypothetical and imaginary methods, and other aspects of underwater diving which have become part of popular culture. Robert William Hamilton Jr. – American physiologist and researcher in hyperbaric physiology. 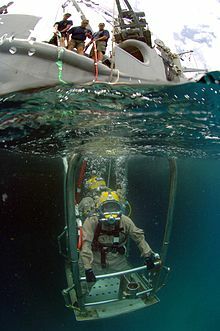 Underwater divers are people who take part in underwater diving activities – Underwater diving is practiced as part of an occupation, or for recreation, where the practitioner submerges below the surface of the water or other liquid for a period which may range between seconds to order of a day at a time, either exposed to the ambient pressure or isolated by a pressure resistant suit, to interact with the underwater environment for pleasure, competitive sport, or as a means to reach a work site for profit or in the pursuit of knowledge, and may use no equipment at all, or a wide range of equipment which may include breathing apparatus, environmental protective clothing, aids to vision, communication, propulsion, maneuverability, buoyancy and safety equipment, and tools for the task at hand. 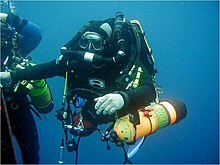 List of underwater divers – List of underwater divers whose exploits have made them notable. Bret Gilliam – Pioneering technical diver and author. 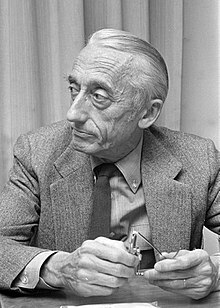 Robert Sténuit – Belgian journalist, writer, underwater archeologist and the first aquanaut. NOGI Awards – Annual awards by Academy of Underwater Arts and Sciences. 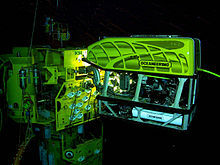 Three wrist-mount dive computers: Hydrospace Explorer Trimix and rebreather dive computer. Suunto Mosquito with aftermarket strap and iDive DAN recreational dive computers. This page was last edited on 10 March 2019, at 14:43 (UTC).